The pump relay on terminal R1 solar control units TDC 2-3-4-5 is electronic (TRIAC), and allows the management of the modulation of standard pumps up to about 140 W absorption. 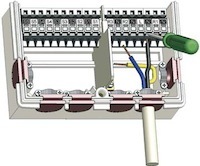 Sometimes, for larger solar systems, it is necessary to use larger pumps that have the highest consumption, so R1 between the output and the solar pump must install a relay to power the pump. But in these cases, since the electronic relay R1, for its characteristics, always releases residues of current, to avoid that the relay remains always operated, must be connected to a capacitor uF 2,5 470VAC R1 between the phase and neutral conductor N.